Section 1, Township 4 North, Range 68 West or approximately 1 mile west of Johnstown, Weld, Colorado on the northwest corner of the intersection. This is a public cemetery which is still in use. All records are in the custody of the Johnstown Town Clerk. 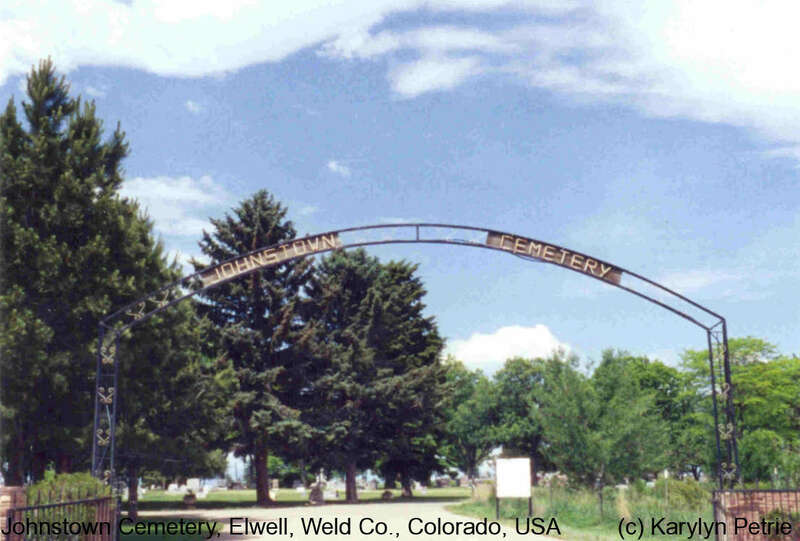 The following is a short history of the Elwell Cemetery received from the Centennial-Bicentennial committee. At a UB Church meeting on November 9, 1901, W. M. Williamson, J. J. Sorenson, and Reverend J. W. Cleaver were appointed a committee and given full authority to make a contract for purchasing land and securing it for a cemetery and paying for the same. The minutes of the UB Church meeting on September 28, 1902, show the members to be in accord on purchasing seven acres just north of the Elwell Store from J. B. Sloan at $20.00 an acre. This area was to be known as the Elwell Cemetery. Lew Worden, clerk at the Elwell Store, kept the cemetery records. When he retired, Mr. J. H. Sloan (son of J. B. Sloan) took over the records. A cemetery association was formed with representatives from Johnstown, Milliken, Elwell, the sugar factory, and the Johnstown Home and Garden Club. Mrs. Lena Kibbey was the president. Trees were planted, water pipes were installed, irrigation ditches were put into use. The women of the Garden Club spent a day raking and had the men haul away the weeds before Memorial Day. As the congregation grew, people felt the Town of Johnstown should sponsor and manage the cemetery. Avote was taken and the Town of Johnstown did take over the cemetery on April 1, 1957. The name was changed from the Elwell Cemetery to the Johnstown Cemetery. A perpetual care plan was provided and grass was planted with the Town of Johnstown furnishing the labor.